Rhodes Visiting Fellowships were set up in 1970, seven years before women were eligible to apply for Rhodes Scholarships. Unlike the Scholars, holders of the Fellowships were expected to have doctorates or be of comparable academic standing, and to use the two years’ tenure in Oxford for independent research. Accordingly the age limit was set higher, at 35 years. Academic merit and a suitable research proposal were the chief criteria. The participating colleges were Lady Margaret Hall, St. Anne’s, St Hugh’s, Somerville and St Hilda’s. Applications were called from a range of countries with former colonial links to Britain, including New Zealand, Australia, Canada, South Africa, India, Pakistan, Singapore, Hong Kong and Malaysia. Finalists were flown to England for their interview and accommodated at the college offering the Fellowship. After a taste of college life, the interviews took place in front of a panel of Senior Members of the college including the Principal. The decision was announced within a few hours. Professor Helen Leach, 2004. 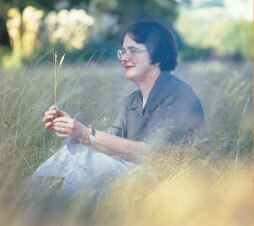 While a Rhodes Fellow in 1980–1, she completed work for her publication 1,000 years of gardening in New Zealand (Reed 1984). Her most recent book was Cultivating myths: fiction, fact & fashion in garden history (Godwit, 2000). On taking up her Fellowship a few months later, an unmarried Fellow was given a set of rooms in college with full dining rights and membership of the Senior Common Room. A Fellow who was accompanied by spouse and/or children would be found accommodation outside college, but could take meals in college if alone. Only 32 Rhodes Visiting Fellowships were awarded, and eleven of the recipients were New Zealanders. Two staff members of the University of Otago have held Rhodes Fellowships: Professor Helen Leach of the Anthropology Department, at St Hilda’s 1980–1981; Ms Mindy Chen-Wishart (formerly a Senior Lecturer in the Faculty of Law, now Law Fellow at Merton, College, Oxford), at St Hilda’s 1992–4. 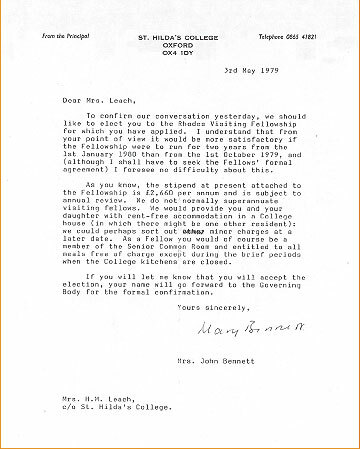 The letter from host college St Hilda’s, Oxford, informing the then Dr Leach of her election to a Rhodes Visiting Fellowship starting 1 January 1980. Private Archive. Louise Nicholson (nee Green), was a Rhodes Fellow in 1978, at a time when her College, Lady Margaret Hall admitted men as under-graduates. Private Archive. Associate Professor Louise FB Nicholson is the Associate Dean Research in the Faculty of Medical and Health Sciences at the University of Auckland. She heads an active research laboratory investigating the molecular mechanism of neurodegenerative diseases of the brain. Other recipients and commencement dates were Dr Christine Ringer (1970–), Dr Pamela Dunbar (1971–), Dr Heather Outred (1973–4), Dr Janet Davidson (1974–6), Dr Karen Cooper (1974), Dr Claire Woodhall (1975–), Dr Elizabeth McLeay (1976–), Prof. Vivienne Gray (1979–80) and Assoc. 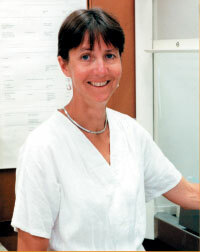 Prof. Louise (Green) Nicholson (1978–80). © 2004 National Library of New Zealand, University of Otago Library and the Web Office.